Muddy Plimsolls has been training clients outdoors and across London for ten years. We know a thing or two about fantastic training venues and time and again we return to the same ones. Here’s our list of four favourites locations (in no particular order). 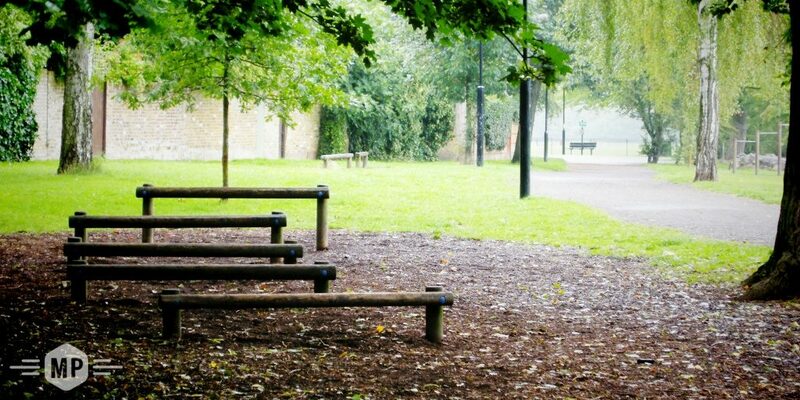 They stretch from Wandsworth Common to Hilly Fields and combine great facilities and a fantastic location, whether you’re working out in the sun or the rain. Whether its calisthenics, yoga, or obstacle course training you’re after, these four sites will definitely help you with your training. Muddy Plimsolls’ training combines bodyweight exercise principles along with the use of a small range of key exercise equipment such as kettlebells, resistance bands and sandbags. Complete our Enquiry Form to get started with a Muddy Plimsolls’ personal trainer and get the most from an outdoor training programme. Worth a try: low hurdles – these hurdles are unusually wide and especially useful set of obstacles for plyometric and balance exercises. Muddy Plimsolls Tip: low pull-up bars – use these as a frame for your feet, to progress your handstand push-ups. Worth a try: suspended plank – a very rare exercise station that could be used for balance work, or as a moving platform for push ups. Muddy Plimsolls Tip: obstacle course – the size and layout of this outdoor gym, plus the inclusion of a tyre-traverse, wooden wall and suspended plank, cry out to be used as an obstacle course. Run around all the stations at a steady jog to get the heart rate going. Worth a try: sit up bench – sit on the bench and hook feet under the metal bar, to maintain a secure position for a set of sit-ups – a staple of core exercise. This piece of equipment could also be used as a Roman Chair. Muddy Plimsolls Tip: short hill sprints – as the site is situated on the top of a hill, short sprints from the base up to the exercise stations will certainly raise heart rate levels. Worth a try: double pole climb – a challenging workout for the back and for grip strength. Standing between the poles, reach up and grip both poles. Pull yourself off the floor and try to hold. Muddy Plimsolls Tip: hurdles – use the set of 5 hurdles (progressing in height) to develop lateral (side) jumps. If the final hurdle proves too high, place hands on the station as you jump over laterally.